Stacey Abrams speaks with her supporters on election night. 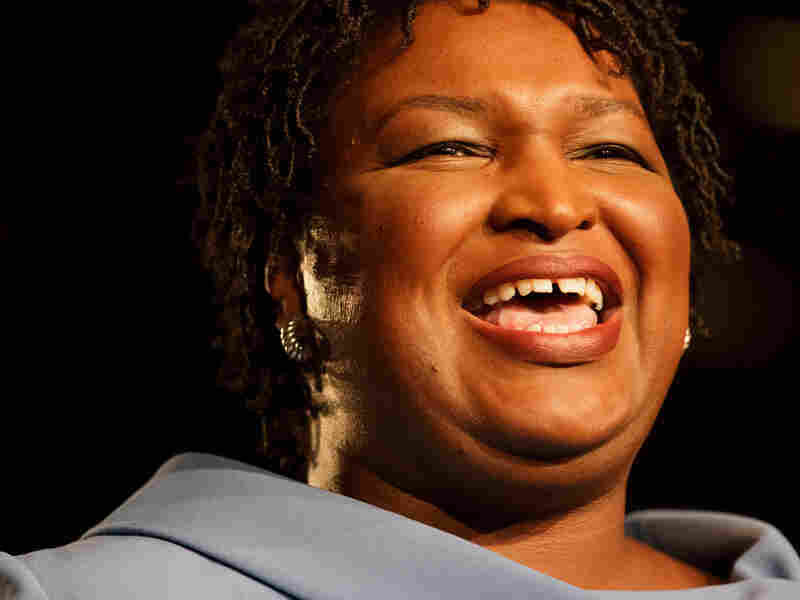 Abrams alleged during her concession speech that her opponent, Brian Kemp, used "deliberate" voter suppression tactics leading up to the election. Stacey Abrams, the Georgia Democrat defeated in a close – and controversy-filled — race for governor, tells NPR's Steve Inskeep in an interview to air on Tuesday's Morning Edition, that she's putting the contest behind her...but not her allegations against the winner, Brian Kemp, who also oversaw the election in his capacity as Secretary of State. Abrams, the 44 year-old attorney and former Minority Leader of the Georgia House of Representatives, says Kemp must be held accountable for the slew of errors and inconsistencies that dogged the contest. Abrams also described her own personal difficulties when voting, after a poll worker incorrectly believed that she had already filed for an absentee ballot. ABRAMS: "The day I voted, I had to correct the poll worker who said that I had filed for an absentee ballot. It took a few minutes for me to be able to cast my ballot, because of the problems with the polling place." INSKEEP: "Did that poll worker have a piece of paper or a computer screen in front of them that said you had already voted absentee when you tried to vote?" ABRAMS: "Yes, yes, and I had to explain to her, 'This is not correct. I've never applied for an absentee ballot.' And she had to get a manager, and they had to fix it. And I did it quietly. I didn't turn it into a major conversation, but it was also emblematic to me of the privilege that I have. I know the law. Others do not. And for us to have a fair fight in Georgia we have to ensure that no one runs the risk of being denied the right to vote." "The totality of the errors made, of the gross mismanagement, of the incompetence — one and a half million people purged [from voter rolls], fifty-three thousand [votes] put on hold, three thousand denied the right to register as new citizens, long polling lines, misplaced provisional ballots – the totality of the issues, demonstrates that there has been gross mismanagement of our elections. I'm not suggesting that I know I would have won, but I am saying that the results were unalterably made less safe and less secure because of the actions taken by the Secretary of State." "I would speculate that that is true. But we don't know, because of how insidious this behavior has been. And that is why I was willing to acknowledge that the election is over. Because, given the current state of our laws, this is what is true. But my point is that it was not a fair fight." Fair Fight Georgia is the name of the initiative that Abrams has launched to advocate for election reforms. One of its first moves will be a lawsuit against the State of Georgia. Abrams wouldn't confirm or deny whether now-Governor-elect Brian Kemp is to be named in the suit, but she did single out the office of the Secretary of State (from which Kemp resigned last Thursday). "Let's be clear: The Secretary of State is responsible for the administration of elections in the state of Georgia. Counties answer to the Secretary of State. And so Fair Fight Georgia will be filing a lawsuit – a federal suit – that will allege gross mismanagement of our elections process. It will be based on thousands of complaints that we received, not only immediately, but things that preceded the election. And it will look at the totality of the challenges facing the state of Georgia." "This is only the beginning of our battle. We have a lot of work to do. Because...this is a county-level issue, this is a local issue, and it's also a citizen issue. And we've got to tackle every single level..."